Hartmann, D.L., Ramanathan, V., Berroir, A. and Hunt, G.E., 1986: Earth radiation budget data and climate research. Rev. Geophys., 24, 439 -- 468. Jacobowitz, H., Suole, H.V., Kyle, H.L., House, F.B. 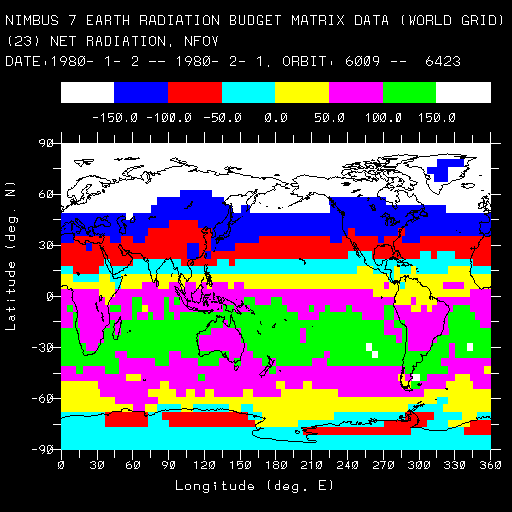 and the Nimbus 7 ERB Experiment Team, 1984a: The Earth Radiation Budget (ERB) experiment: an overview. J. Geophys. Res., 89, 5021 -- 5038. Jacobowitz, H., Tighe, R.J. and the Nimbus 7 ERB Experiment Team, 1984b: The earth radiation budget derived from the Nimbus 7 ERB experiment. J. Geophys. Res., 89, 4997 -- 5010. Kandel, R.S., 1990: Satellite observation of the earth radiation budget and clouds. Space Science Reviews, 52, 1 -- 32. 久保田 効, 今井博子, 1986a: 地球放射収支の海陸差について。 気象衛星センター技術報告, 13, 1 -- 31. Kubota, I. and Imai, H., 1986b: Land-sea contrast in the earth radiation budget. J. Meteorol. Soc. Japan, 64, 871 -- 879. Kubota, I., 1989: Land-sea difference of the earth radiation budget. Geophysical Magazine (Japan Meteorological Agency), 43, 19 -- 43. Kyle, H.L., Vasanth, K.L. and the Nimbus 7 ERB Experiment Team, 1986: Some characteristic differences in the earth's radiation budgets over land and ocean derived from the Nimbus-7 ERB experiment. J. Appl. Meteorol., 25, 958 -- 980. Kyle, H.L., Hickey, J.R., Ardanuy, P.E., Jacobowitz, H., Arking, A., Campbell, G.G., House, F.B., Maschhoff, R., Smith, G.L., Stowe, L.L. and Vonder Haar, T., 1993: The Nimbus Earth Radiation Budget (ERB) Experiment: 1975 to 1992. Bull. Amer. Meteorol. Soc., 74, 815 -- 831. Masuda, K., 1988: Meridional heat transport by the atmosphere and the ocean: analysis of FGGE data. Tellus, 40A, 285 -- 302. Ray, S.N. and Vasanth, K.L., 1984: Nimbus 7 Earth Radiation Budget (ERB) MATRIX User's Guide, Volume II: Tape specifications. NASA Contractor Report CR 170620. Tighe, R.J. and Shen, M.Y.H., 1984: Nimbus 7 Earth Radiation Budget (ERB) MATRIX User's Guide, Volume I: Experiment description and quality control report for year 1. NASA Contractor Report CR 170619.